You are viewing 2006 which is posted in the miscellaneous category. BEST BOOK: 02.16.06 I really enjoyed Case Histories by Kate Atkinson. A detective thriller, the story is told from multiple points of view and places as much importance on character development as plot twists. BEST GALLERY SHOW: 03.11.06 The American Folk Art Museum show, Obsessive Drawing, showcased five self-taught artists compelled to make repetitive marks and lines on huge sheets of paper. Fascinating. BEST GIFT FROM THE CITY OF NEW YORK: 05.18.06 Ride home in the back of a police car after the bus we were on was hit by a drunk driver. Thank you Precinct 114! BEST EXCUSE TO GET SOAKED: 07.18.06 Picnic blankets covered the Great Lawn in Central Park, the New York Philharmonic concert ended, fireworks lit up the sky and then it was a down right down pour. BEST NETFLIX RENTAL: 07.26.06 Enron: The Smartest Guys in the Room. I always wondered how people got away with greedy unethical business dealings and this documentary showed me how. BEST SHOW: 09.02.06 Uzeda and Shellac givin' their all at a Polish Lounge in Brooklyn. And we sat at the bar long enough to learn how to pronounce Zywiec from the bartender. BEST FORWARDED EMAIL I RECEIVED: 12.20.06 Who can resist baby pandas? 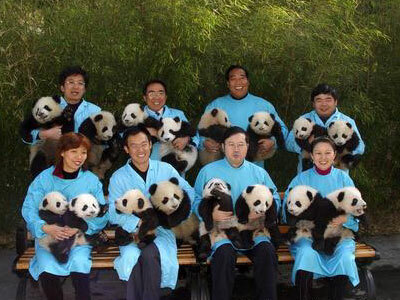 The email had the headline, One Zoo in Southwest China Has Its Hands Full with 16 Baby Pandas. and was followed by several photos of the wide-eyed cubs. BEST MEAL: 12.24.06 Homemade ravioli with roasted chestnuts, pancetta and apples. is it me or do those panda heads look like soccer balls if you squint your eyes?